5. Jane Bell . Daughter of William Bell & Janet Oliver. Born 1842 in Harvey. Christen 10 Sep 1842 in Harvey By Rev. Daniel McCurdy. Died 10 Dec 1889 in Harvey. Buried in Harvey Settlement Cemetery. From Church death records: Jane Bell, died 10 Dec 1889, age 47 yr. 5 mo. 6. Mary Bell . Daughter of William Bell & Janet Oliver. Born 10 Apr 1843 in Harvey. Christen 23 Jun 1844 in Harvey By Rev. Daniel McCurdy . Died 12 Dec 1929 in Harvey. Buried in Harvey Settlement Cemetery. Birth date from 1901 census for Manners Sutton: 10 Apr 1844, and on gravestone Harvey Settlement Cemetery: 1844-1929. Harvey Station, Dec 17 -- The death of Mrs Mary Smith, widow of Alexander Smith, occurred at her home in Wilmot, York County, on Thursday morning. Deceased, who was the daughter of the late William and Janet (Oliver) Bell, of Manners Sutton was in her eighty-sixth year, having been born on April 10, 1843. She is survived by one sister, Mrs Isabel Wilson, of Manners Sutton, and the following children: George of Wilmot; Hugh Talbot, at home; Mrs John Bailey, Fredericton Junction; Mrs James Wilkins, Wilmot; Edna, teacher at East Florenceville, and Elizabeth and Nellie, at home. The funeral was held on Friday, Rev. George E. Knight conducting the service, assisted by Rev. J. H. MacLean. The hymns sang were "Nearer My God to Thee," "A Day's March Nearer Home," and, by request, "Beautiful Isle of Somewhere" as a solo by Rev. Mr Knight. The pallbearers were George and Everett Smith and James and Lawrence Wilkins. Interment was in Manners Sutton Cemetery. She married Alexander James Smith, 15 Aug 1864 in St. Paul's Church Records, Fredericton. Born 1835 in Scotland. Died 1897 in Harvey. Buried in Harvey Settlement Cemetery. Occupation Farmer. In the 1861 Census, Alexander, 25 years old, Scotch, general labourer, Presbyterian, was a lodger in the home of Nicholas Gass. From the Colonial Farmer, 22 Aug 1864: "Married 15th inst., by Rev. 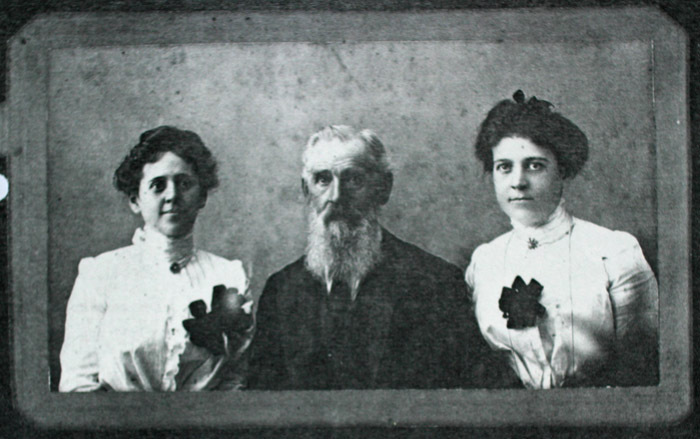 Dr. Brooke, Alexander Smith and Miss Mary Bell, both of Manners Sutton parish." Alexander and Mary were farmers at Thomaston (Wilmot). 7. Isabelle "Belle" Bell . Daughter of William Bell & Janet Oliver. Born 20 Oct 1845 in Harvey. Christen 22 Nov 1845 in Harvey By Rev. Daniel McCurdy. Died 27 May 1931 in Harvey Sta. Buried in Harvey Settlement Cemetery. Belle was the second wife of Alexander Wilson. Harvey Station, York Co., June 1 -- Mrs Isabelle Wilson, widow of Alex Wilson, passed away on May 27 in her 86th year after a short illness. She was the last survivor of her immediate family, the daughter of the late William and Janet Bell, of Scotland. The funeral service was held at her home Friday afternoon, conducted by Rev. George E. Knight and Rev. J. H. McLean. Favorite hymns were sung by a quartette and a solo by Mr Knight. She leaves to mourn four sons, A. J., W. Heber, Oliver J. and Levi T., and two daughters, Mrs J. A. Johnston and Mrs E. I. McConnell, Brooklyn, N.Y. Interment was at Harvey cemetery. The pallbearers were Alexander and Thomas Wilson, Eastman and James Bell, Arthur Mowatt and Charles Little. She married Alexander Wilson, son of Robert Wilson & Mary Brown, 8 Jul 1873 in Christ Church Cathedral, Fredericton . Born 23 Jan 1834 in Lennilhill, Scotland. Died 28 May 1906 in Harvey. Buried in Harvey Settlement Cemetery. Occupation Storekeeper, Carpenter, Farmer. 3 Sep 1901 photograph of Alexander Wilson aged 68 (b. 23 Jan 1834, Lennilhill, Scotland; d.28 May 1906, Harvey Station; and two daughters Sarah aged 28 (L) and Nellie, aged 20 (R). (Source: JSH, 25 Jul 2006). Alex came to NB in 1837 with his parents and siblings, who were among the first settlers of Harvey Settlement. He was married twice, first to Isabella Craigs and had six children; second to Isabelle Bell and had six children. Alex's occupation in the 1871 Census was Storekeeper. He was also a carpenter, and made all the coffins in the area, and he was a farmer. PANB #F15552, p. 432: Alexander Wilson and Isabella Craigs were married on 18 Apr 1861 both of Manners Sutton, witnesses James Wilson, Margaret Craigs and Thomas Craigs. PANB Marriage Records of York Co, NB (1837-1888): Alexander Wilson and Isabella Bell, both of the Parish of Manners Sutton were married by license in Christ Church Cathedral, Fredericton, according to the rites of the Church of England, on 8 Jul 1873 by John Pearson (Sub Dean). Witnesses were Elizabeth Bell and J. Coombs. Undated photograph of Alexander Wilson (b. 23 Jan 1834, Lennilhill, Scotland; d.28 May 1906, Harvey Station; wife Isabella "Belle" Bell (b. 20 Oct 1845, d. 27 May 1931), their daughter Sarah Wilson (b 16 Mar 1874, Harvey; d. 11 Sep 1966, Harvey) and her son Wilson McConnell. (Source: JSH, 25 Jul 2006). 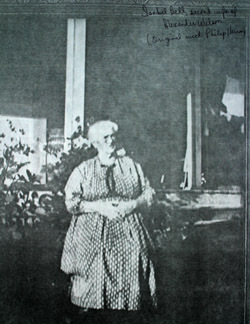 Undated photograph of Isabella "Belle" Bell (b. 20 Oct 1845, d. 27 May 1931). (Source: JSH, 25 Jul 2006). For further information on this family see the book, "The Wilsons of Harvey, 1798 - 1983" by Jocelean Swan Hall. 8. John Alexander "Jack" Bell . Son of William Bell & Janet Oliver. Born 3 May 1847 in Harvey. Christen 27 Jun 1847 in Harvey By Rev. Daniel McCurdy. Died 8 Jul 1922. Buried in Harvey Settlement Cemetery. From New Brunswick Reporter, 26 Jul 1867: "Married 16th inst. by Rev. 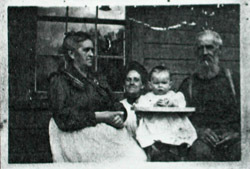 J. Lathern, John Bell, Harvey (York Co.) and Miss Jane Cleghorn, same place." He married Jane "Jean" Cleghorn, daughter of George Cleghorn & Agnes Hogg, 16 Jul 1867 in York Co., NB. Born 3 May 1846 in Scotland. Died 13 Mar 1919 in Tweedside. Buried in Harvey Settlement Cemetery. 9. Eleanor "Ellen Or Nellie" Bell . Daughter of William Bell & Janet Oliver. Born 1849 in Harvey. Christen 18 Mar 1849 in Harvey By Rev. Daniel McCurdy. In 1888 Ellen worked in Boston where she had a dressmaking business. 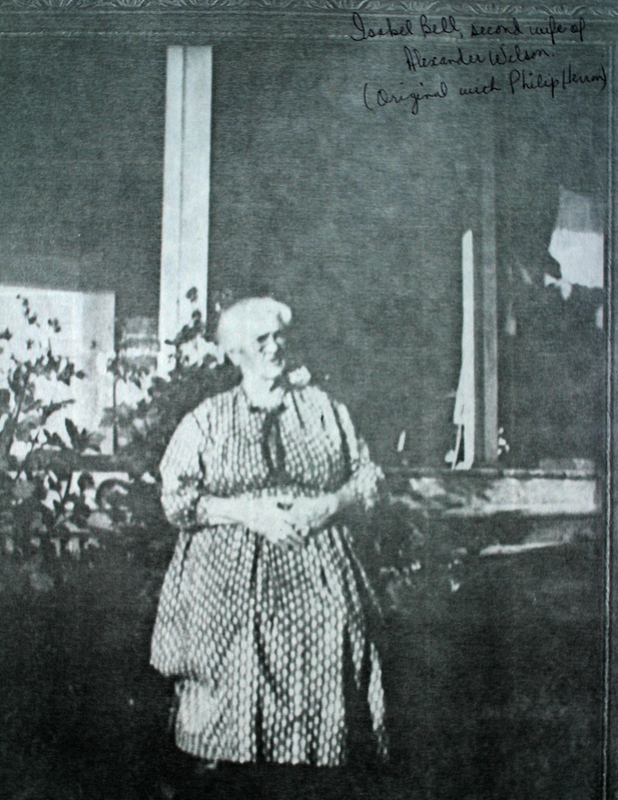 She married in U.S.A., lived in Elmo, Maine in 1896, and in Olympia, Wash. in 1918. She married T. Hawkes, in U.S.A.
10. George Bell . Son of William Bell & Janet Oliver. Born 14 May 1851 in Harvey. Christen 28 Jul 1851 in St. Paul's Church Records, Fredericton. George married in U.S.A. Lived in Olympia, Wash. in 1918. 11. Elizabeth "Bessie" Bell . Daughter of William Bell & Janet Oliver. Born Approx 1853 in Harvey. Died Approx 1918 in Olympia, Wash. Bessie lived in Dover, Mass. in 1896. She married Levi A. Talbot.